Hope you all had a happy and blessed Easter! I sure did :) So sorry for being MIA. Definitely meant to update over spring break, but I needed a lot more rest than I realized AND I made the "mistake" of picking up The Hunger Games...and couldn't stop reading until I finished all three! And then I went to watch it and thought it was pretty good! What did you guys think? Anyway, here's a quick post of my a chicken recipe my friend introduced to me a few years ago. It's my favorite since it's super quick and simple. You only need 2 ingredients that most people find in their kitchens: Chicken & Italian dressing. Also, chicken is easy to buy when on sale, freeze, defrost when needed and cook. This recipe literally takes 5 minutes of prep time and results in a moist and tasty dish. However, it does take some planning ahead as you'll see. Remove chicken from packaging, rinse, skim away any fat and place chicken in the Ziploc bag. 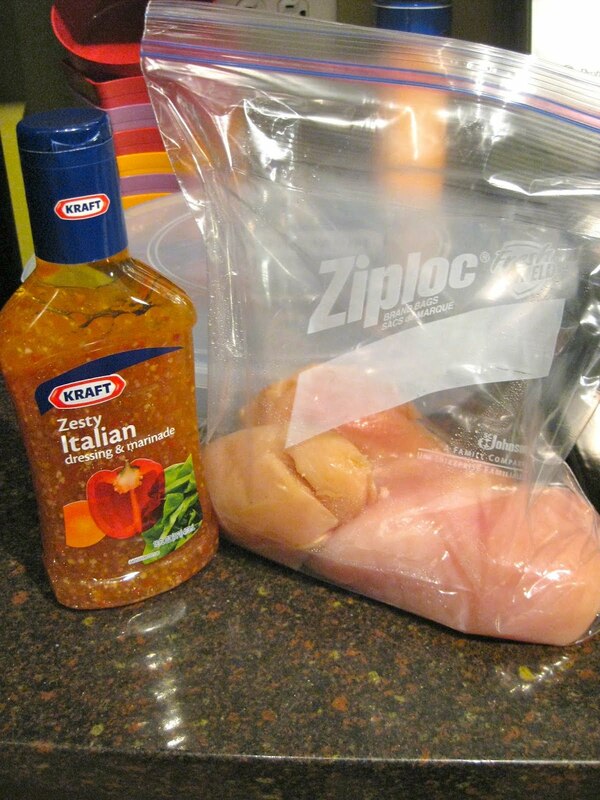 Dump the Italian dressing into the Ziploc bag. Close the bag and ensure all of the chicken is covered with the dressing. If you find that it's not enough dressing, feel free to add more. I usually eye-ball it every time. Leave the chicken in the fridge to allow it to marinate well. I'd suggest doing the prep work at least 12 hours ahead of time for the most tasty results. But if for some reason you can't prep that far ahead of time, start at least 3 hours prior to when you need the chicken cooked. 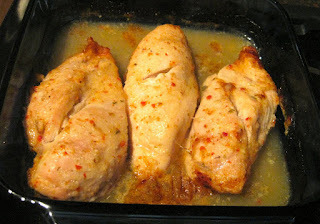 When you are ready to cook, preheat your oven to 350 deg F. Place the prepared chicken into a baking dish. Pour most of the dressing in with it as well. Bake for one hour or until the chicken is cooked thoroughly. I usually check at around 50 minutes and use a knife to cut in the middles to check for any red/pink-ness. When there is no red/pink-ness, remove the chicken and serve! I like to serve this with a simple pasta with red sauce or noodles with garlic and EVOO. Also, you can shred the chicken and use it in a cool pasta salad. I'll try to post my pasta salad recipe sometime soon! I might try Italian dressing once. There are so many in the shops but I'm not familiar with Italian cuisine so it's hard to know which one is good.